Bronzite is the commercial name for an aggregate of the magnesium and iron bearing minerals of Enstatite​ and Hypersthene. It has a green-brown to brown colour with a bronze-like sub-metallic lustre. As the magnesium rich enstatite and the hypersthene which had 50% iron in its composition "weather" and over time the mineral that remains rather than being called enstatite-hyersthene has been given the name Bronzite. 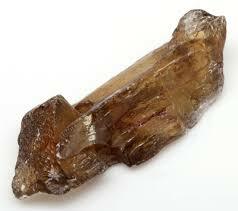 Bronzite facilitates your ability to simply "be", by entering a dynamic state of non action and non doing. Spiritually this is the perfect stone if you have difficulty stilling yourself, since it brings total serenity. 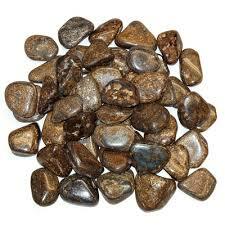 Bronzite is effective against curses, is a magical protector and turns back negative thoughts and ill-wishing. However it returns, the ill-wishing, cures or spells back to the source considerably magnified and perpetuating the problem as it bounces backward and forward, becoming stronger each time and it makes the ill wisher feel extremely ill while the recipient remains protected but aware of the energetic disturbance. It is more effective to use bronzite in combination with black tourmaline, as this absorbs the ill wishing, immediately stopping the interaction and taking attention away from the source. Bronzite is helpful for helping with certainty and with taking control of our actions. It can also help one to think ahead about things, enhancing the ability to take control of our own lives. 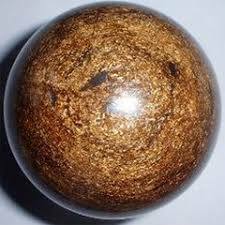 In this, because bronzite helps dispel uncertainty, it can help us also take necessary actions for our own benefit, while still being loving and polite and principled in our behaviour. Bronzite is a good grounding stone also. It is excellent for these same reasons to promote change in a harmonious way. Psychologically, this crystal is a stone of courtesy, it strengthens non judgemental discernment, pin points your most important choices and promotes decisive action. This protective and grounding stone is helpful when you feel powerless in discordant situations or are in the grip of events beyond your control. Holding bronzite will increase self assertion, restore composure and assist in keeping a cool head. With its assistance, you can take an objective perspective and see the bigger picture. It is helpful for overcoming stress and reversing wilfulness, teaching how to go with the flow of divine will. 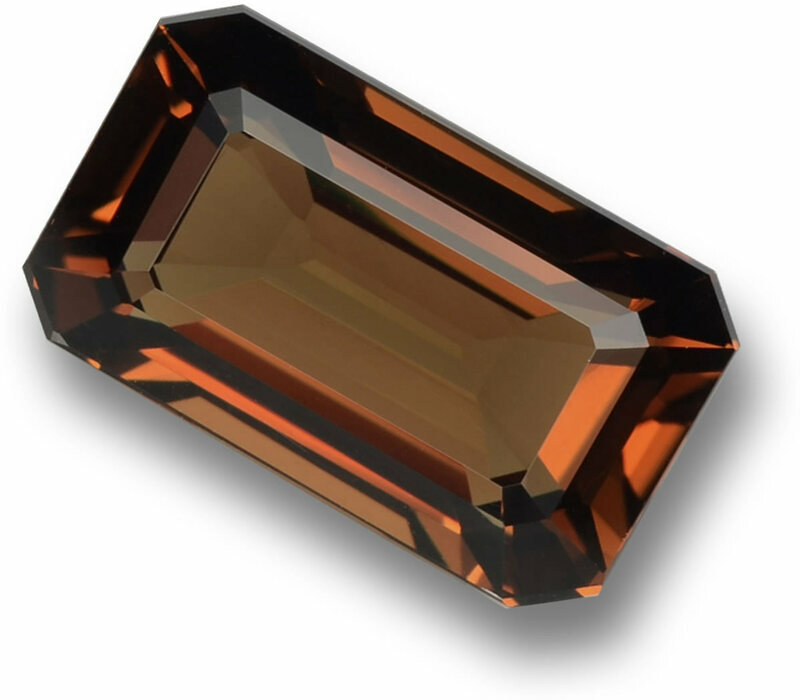 If you have become stuck in any negative pattern, bronzite releases it. Bronzite is useful for supporting and balancing masculine yang energy with in the body of the psyche. 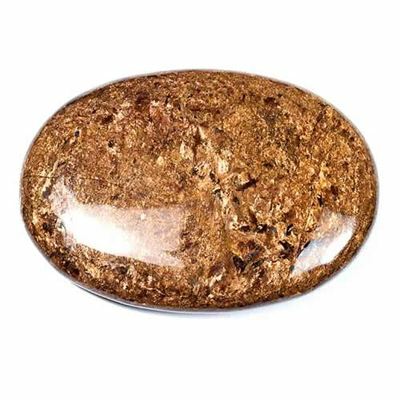 Bronzite is helpful for chronic exhaustion, the assimilation of iron, cramps and nerves. Bronzite is used in crystal healing for ailments related to the solar plexus chakra, assimilation of iron, lessening muscular tension, dispelling restlessness caused by emotional and psycho-physical ailments. Enstatite is a magnesium silicate of the pyroxene group of minerals. It is a relatively common mineral and is found in metamorphic and some igneous rocks as well as in stony and iron meteorites. It forms a solid solution series with the minerals hypersthene and ferrosilite. A solid solution series occurs when two or more elements can substitute for each other in a crystal structure without much alteration of the structure. In this case, the elements are iron and magnesium with enstatite being the magnesium end member of the series. 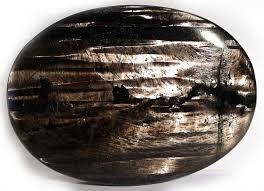 Hypersthene is the intermediate member with around 50% iron and ferrosilite is the iron rich end member of the series. Enstatite occurs as white, colourless, grey, light brown or pale green in colour with a vitreous to pearly lustre. This stone has a stubby prismatic habit but more often is massive or in coarse lamellar or fibrous aggregates. Enstatite is lively, friendly, and can have a mood-lifting effect. This stone will help you to re-charge the flow of energy within your body, while keeping our feet firmly on the ground. It aligns the major chakras, and opens the Base, Solar Plexus, Throat, Third Eye and Crown. It can be used in regression work, including past life regression. Enstatite will enhance your determination and flexibility. This stone will promote fairness and unbiased judgement. 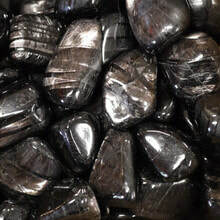 Hypersthene is a magnesium iron silicate that belongs to the pyroxene group of minerals. ​The crystal colours are grey, brown or green. Hypersthene is vitreous to pearly and have a stubby prismatic habit but more commonly can be found in massive or coarse lamellar or fibrous aggregates. Hypersthene enhances your ability to clearly see what is right, and to know when to act. This stone enables you to use better judgement in all areas of life. Hypersthene reduces stress, anxiety and tension. This stone promotes a spiritual and universal awareness, and heightens psychic ability. Emotionally this stone will help you understand and deal with depression, anxiety and panic attacks. Spiritually this stone enhances past life regression, strengthen clairaudience, channelling and communication with the spirit realm.